Royal Crown Derby was one of the earliest English porcelain factories (1740s), the first factory being located in Nottingham Road, Derby. The current factory at Osmaston Road was purpose built in 1875, and the long established tradition of fine ceramics is continued today at the same location. The title ‘Royal’ was awarded by Queen Victoria in 1890. 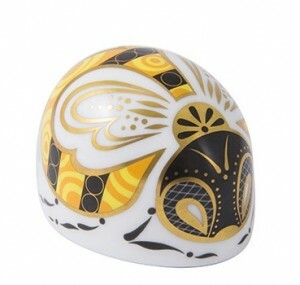 As well as its fine porcelain, Royal Crown Derby has an established reputation for its fine inlaid ceramics, notably paperweights. The Royal Crown Derby Collectors Guild allows members to receive a joining gift and the opportunity to buy special Guild only pieces. The 2016 membership piece is Bumblebee and members only paperweights include the Peacock Butterfly. Benefits also include a quarterly Guild magazine and newsletter, invitations to special events and a privileged customer programme. NOTICE – This site is not affiliated with Royal Crown Derby TM. 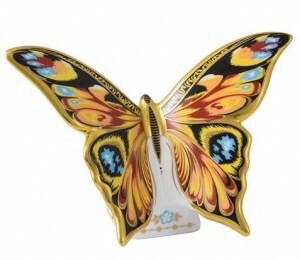 The purpose of these pages is to provide information to collectors of Royal Crown Derby.